Neo Geo CD SNK NTSC-J. REAL BOUT FATAL FURY SPECIAL. Instruction - C. Item is complete and basically as photo shown. Platform: Nintendo SNES. Region Code: NTSC-U/C (US/Canada). Notes: Tested. Condition: Good. SKU: SD507410366. 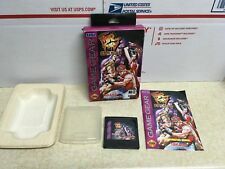 Sega Saturn Real Bout Fatal Fury Special. Japan Version. 100% genuine Item. Working Tested. Manual has a creased upper right corner. Upper right side has a tear/cut, see photos. Neogeo Real Bout Fatal Fury Special. Japan Version. 100% genuine Item. Pictured is the actual item you will receive. Tested, working. FATAL FURY SPECIAL. Instruction - ( Mark ). Case - ( Pressed ). SUPER NINTENDO SNES - FATAL FURY Game CART w/BOX Tested PLAYS GREAT! 4 out of 5 stars - SUPER NINTENDO SNES - FATAL FURY Game CART w/BOX Tested PLAYS GREAT! 4 product ratings4 product ratings - SUPER NINTENDO SNES - FATAL FURY Game CART w/BOX Tested PLAYS GREAT! Neo Geo CD - Real Bout Fatal Fury Special (JAP Version) (boxed) (used). Real Bout Fatal Fury Special. Spielsprache Japanese. Pattern picture! Item may differ from the photo. The Konsolenkost-Team wishes you a lot of fun. SNES / Super Famicom - Garou Densetsu Special / Fatal Fury (JAP Import) (boxed) (very good condition) (used). Garou Densetsu Special / Fatal Fury. Spielsprache Japanese. Pattern picture! Item may differ from the photo. SpielLanguage usually English. Pattern picture! Item may differ from the photo. The Konsolenkost-Team wishes you a lot of fun. JAP Version, boxed, very good condition, used. Important Notes. Cancellation Right. 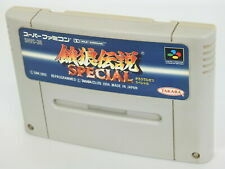 Nintendo Super Famicom Fatal Fury Special. Japan Version. Working Tested. Trending at C $18.77eBay determines this price through a machine-learned model of the product's sale prices within the last 90 days. Neogeo CD Real Bout Fatal Fury Special. Japan Version. 100% genuine Item. Nintendo Super Famicom Fatal Fury Special Garou Densetsu. Japan Version. 100% SNK original product. They are basically fixed and applicable to any country in the world. 3-Pictures might not be showing the actual item. Cependant, les petits objets ou objets a format standard de type CD ou DVD par exemple pourront etre envoyes dans une enveloppe apres avoir ete emballes dans du plastique bulle. Fatal Fury Special. Our Products are 100% Authentic. REAL BOUT FATAL FURY SPECIAL. Neo Geo CD　NTSC-J. Spine Card - B. REAL BOUT FATAL FURY SPECIAL. Neo Geo CD NTSC-J. Instruction - B. Middle East. We are really glad to have a deal with people all over the world. Our products are 100% Authentic. Box : slightly scuffs. has faded. This item is new. Super Famicom "Ganbare Goemon 3".